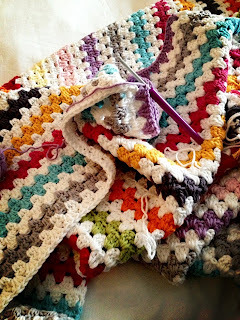 I still have a whole 2 days until #projectcrochet wraps up, so maybe I’ll get it done? But my main goal was to get it done during the olympics – take advantage of the extra TV watching and all. I came close! this is how it’s looking so far – I think just a few more stripes wider compared to it’s length…. I probably made it a little longer than I should have, but I didn’t want it to be too short. She wanted it to be able to cover her feet – got that, and then some! I don’t think I’ve even made a whole blanket, so even though it’s taking a little longer, I’m pretty excited about it and the progress!! And so you love stripes?! I’m not the only one with a stripe project and tutorial today. A few other awesome bloggers (who also happen to be part of my Sugar Bee Contributors team) have some super cool ideas to share – – be sure to follow the links below to find their projects and check out the #CreativeBuzz of the group! 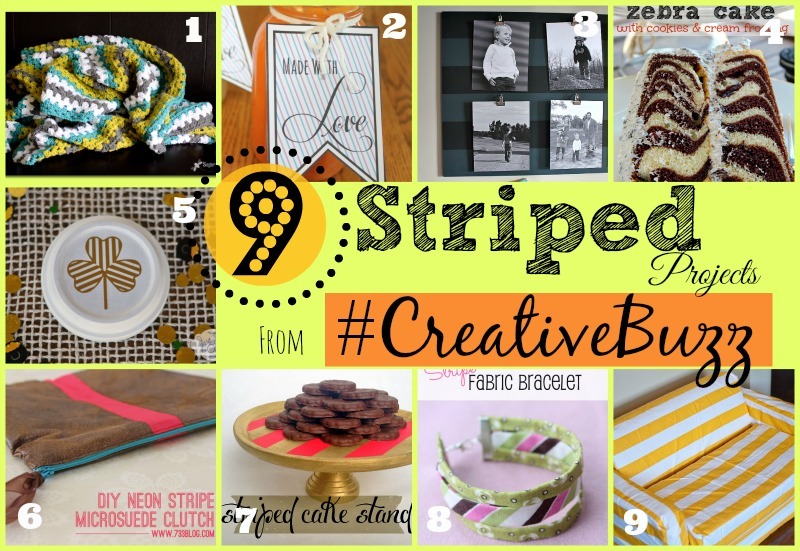 search social media for #CreativeBuzz each month to see what we’re all up to! This turned out so wonderfully! I absolutely love the colors that you chose! I agree Mandy, I also just want someone to sit beside me & SHOW me the way to do this! THANKS for the video, this will help me far more than reading a pattern or looking at a drawing!! LOVE the colors you chose & how long this is going to be!! I love to have enuf to “tuck” my feet in @ the bottom!!! Great projects, I just found your blog through pinterest (ruffled key chain project). You mention an etsy site but I couldn’t find it under Sugar Bee Crafts, do you still have a site and do you sell the keychains?? Hey Carla – – I don’t have anything in my etsy shop right now – sorry!! Mandy, I am in love with the colors you choose. And, and I embarrassed that I have still not learned to crochet. I should watch your videos and get on that! oh gotcha, are you still going to use your etsy shop?? If so, I would love to add it to my favorite shops. Do you have a link or the nam that I can search? Thanks! 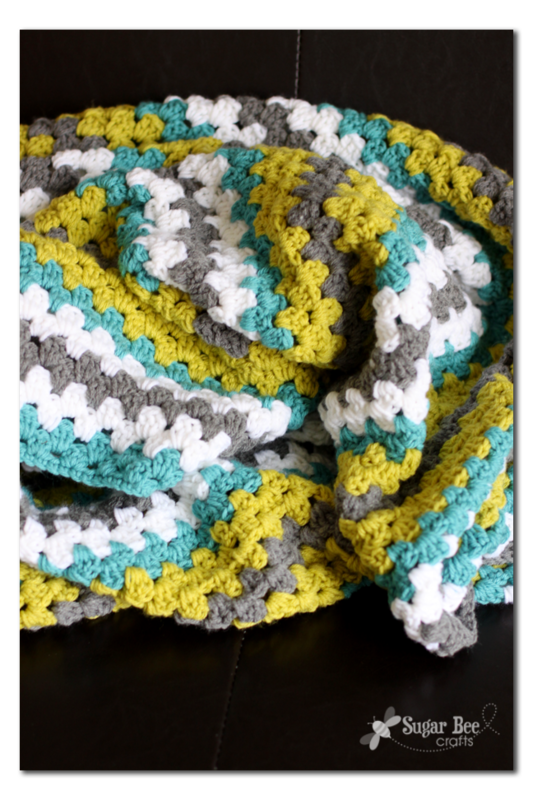 Great afghan – I love the colors. I have one that looks kind of like this that my husbands aunt made for my son years ago. I got a lot of crochet and knitting done during the Olympics, too. I was able to complete a crochet infinity scarf and a feather and fan knit scarf. The TV time was extra working time for me! 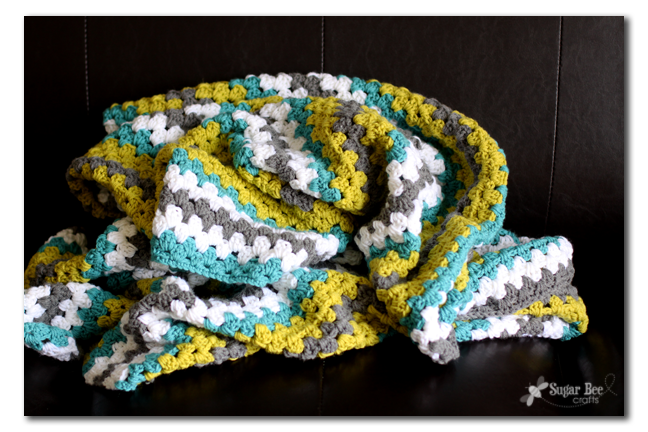 I love this blanket/afghan/throw! 😉 I don’t know if I have the patience to finish an entire blanket, but like you, watching it progress might help me to keep on going! I LOVE this! So adorable and cozy! I love the colors! Can I ask how many skeins of each it took you to make yours? Angie, it’s pretty big, so it probably depends on what size you want. So far 2 skeins of each color has been enough. Thanks! just a question: for the next row how many do you chain up? 3? yes, chain up 3 for the next row – good luck! What is the stripe pattern? It looks like some colors you crocheted two rows and other rows three, but can’t quite tell. Thanks! Hi Elizabeth, you’re right – – some I did 2 rows and some I did 3, and some are 4 (I think!) – I just made it up as I went along, so I’m sure that’s not very helpful, sorry! What brand of yarn did you use? I love the colors! My daughter found this on Pinterest and loved the colors. Would you be able to tell be the colors used and what brand? That’s ok. Just wondered if the colors were turquoise and mustard? sorry, we’re in temporary housing as we build our house, and everything is in storage, boxed up! fingers crossed for the end of January – but I know I bought them at Michael’s, and they don’t have a ton of yarn, so it might jump out at you when you’re there. Good luck! I just finished this crochet project as a Christmas gift and loved it! 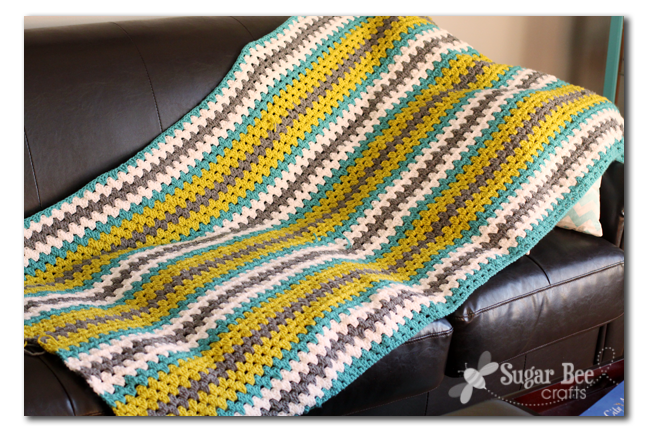 Your video tutorial was very helpful for a beginning crocheter. I copied your color pattern with and it turned out beautiful, thank you so much! AWesome! Congrats on finishing yours! I was just wondering how many skeins of yarn you used. Thanks! hmm, great question – – I think I bought 3-4 of each color — that’s a guess! and I figured I could return the extra if I didn’t use it all. 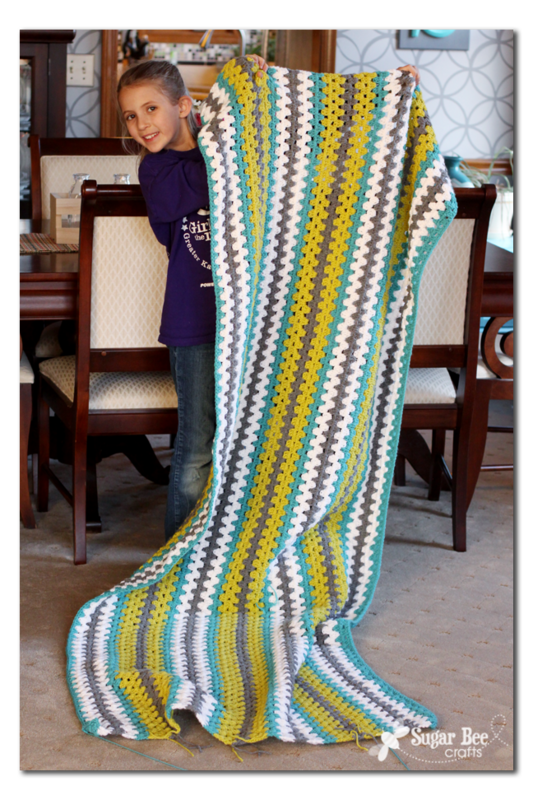 Do you happen to have a picture that shows the entire inspiration afghan? I would love to try making it but I don’t think I’m seeing all of the colors. sorry, I don’t, and we’re in the process of moving so it’s packed up so I can’t snap a new one right now – sorry! This is so pretty!! I love your site! Mandy, thank you for the video! I also love the colors as well as the easy way you manage to teach us this. I just would like to ask you how do you work the color change, I mean, how do you change the yarn for each different line.